Public higher education is generally a state government function, with local governments generally (and not always) responsible for community colleges. This brief post will compare the level of employment and payroll in different places for this function, using data from the 2012 Census of Governments. Higher education costs have exploded in recent decades, leaving a generation of former students deep in debt, but the reason is different for public colleges and universities than for private colleges and universities. In the private sector soaring amenities and rising staffing are primarily responsible. In the public sector, the cause of rising tuition is reduced tax-based support. Virtually nothing, except housing programs for low- and moderate-income people, has been cut as much in recent years as public higher education. New York State is radically different than other states regarding public higher education, and public higher education is treated radically differently than other public services in New York State. The public employee unions dominate state and local government in New York the way the wealthy dominate the federal government, and the state legislature generally seeks to get the general public to pay more for less. Compared with other states, however, New York has squeezed public higher education workers to try to keep tuition down for students. Even in public higher education and even in New York State, however, one surprising fact has always bothered me. The number of full time equivalent non-instructional workers exceeds the number of full time equivalent instructional workers (ie. the professors). The charts and further commentary may be found below. 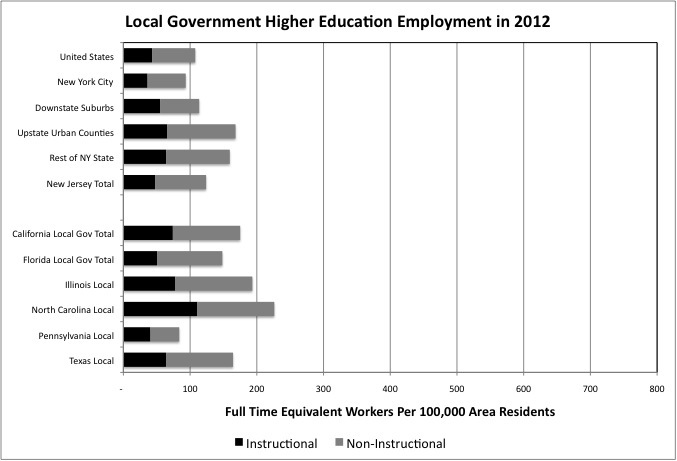 Let’s start with local government higher education employment, generally community colleges. Before the 1970s fiscal crisis the City University of New York (CUNY) was run by the City of New York, but it is now run by the State of New York just like the State University of New York (SUNY), and classified as “state government” (with the exception of community colleges). No local government higher education employment is reported for Connecticut, Massachusetts, or Minnesota. Community colleges in those states, if any, are presumably classified as “state government” as well. The chart shows that New York City had 36 full time equivalent local government higher education instructional employees per 100,000 residents in March 2012, lower than the U.S. average of 43. Instructional employment per 100,000 residents was above the U.S. average in the Downstate Suburbs (Nassau, Suffolk, Westchester, Rockland, and Putnam counties) at 55, in the Upstate Urban Counties (Albany, Broome, Dutchess, Erie, Monroe, Niagara, Oneida, Onondaga, Orange, Rensselaer, Saratoga, Schenectady) at 66, in the Rest of New York State at 95, and in New Jersey at 76. It was higher still in states known for relatively strong community college systems with extensive occupational training such as California and North Carolina. Florida and Texas were also well above the U.S. average by this measure, with Pennsylvania well below. In none of these areas, however, did the number of instructional employees exceed the number of non-instructional workers. Instructional workers were 40.0% of the total full time equivalent local government higher education workforce nationwide in 2012, with a similar proportion (38.0% to 43.0%) in New York City, the Upstate Urban Counties, the Rest of New York State, New Jersey, California, Illinois, and Texas. Florida is even lower at 34.1%. The Downstate Suburbs and North Carolina are relatively high at 48.6% and 48.8%, respectively. Obviously higher education is not the same as elementary and secondary education in that many of the students are in residents, and managing their living environment requires more non-instructional staff. But not many students go away to reside at community colleges. I asked the Census Bureau if the trend of hiring self-employed, adjunct professors to a series of part-time gigs might explain the low level of instructional employment as compared with non-instructional. The Bureau replied that those responding to the questionnaire are instructed to classify these workers as part time instructional employees, who are then weighted into full time equivalents by their hours, even if they are not employees and do not get benefits. How about students with campus jobs and teaching assistantships? They are counted as non-instructional, but again weighted by their limited number of hours. The next chart shows full time equivalent employment per 100,000 residents by state for state colleges and universities (including CUNY in New York). Higher education accounted for 39.7% of all U.S. state government workers in March 2012 according to the Census of Governments. Higher education and prisons, the two functions generally undertake directly by states rather than localities, accounted for about half of all state government workers in the U.S. The data shows that New York State had 270 full time equivalent higher education employees per 100,000 residents in March 2012, or about half the U.S. average of 545. Instructional workers were 37.6% of the total staff at SUNY and CUNY, higher than the U.S. average of 32.6% and higher than any state shown except Minnesota at 40.6%. If one assumes that being taught by the professors is the reason students attend colleges and universities to begin with, it is easy to see why some believe that higher education is going to move online. Particularly if one suspects that private colleges and universities, with their one-upmanship on amenities and services, have even more non-instructional staff relative to instructional staff. 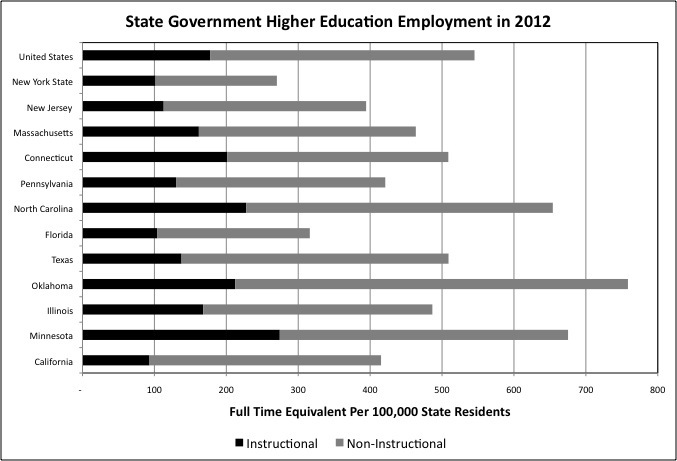 Total state government higher education employment is also below the U.S. average per 100,000 residents in New Jersey, Massachusetts, and Pennsylvania. The reason is that in much of the Northeast students are far more likely to attend private colleges and universities established before the federal “land grant” program was established in the 1860s. The purpose of the land grant program was to provide a federal subsidy for state colleges and universities in relatively new states: these often became the leading colleges of those states. The Bureau of Labor Statistics data on private college and university employment per 100,000 residents is not comparable to the Census Bureau data shown previously, because each part time worker is counted as one worker, the same as a full time worker. Rather than as part of one “full time equivalent worker” as in the Census of Governments data. 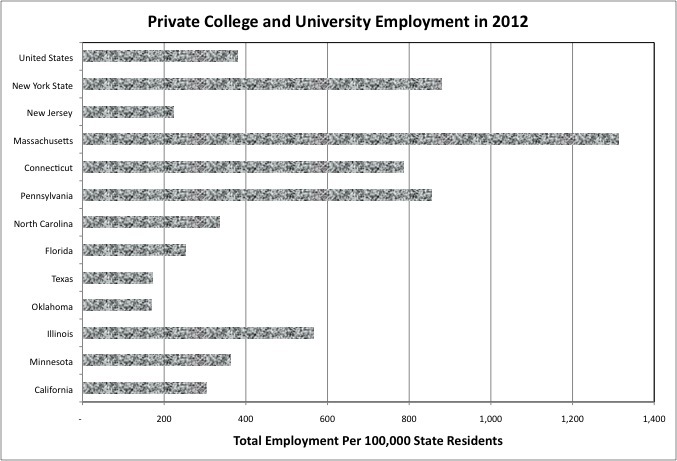 Nonetheless, the data shows that private college employment is very high, relative to the U.S. average, in New York State, Massachusetts, Connecticut and Pennsylvania. Not only because residents of these states are more likely to attend private colleges and universities, but also because residents of other states are more likely to attend private colleges and universities in the Northeast. Higher education, in fact, is a key component of the economic base of Upstate New York, and one of the main remaining strong economic links between that area and Downstate New York (and New Jersey). Those moving to New York City from elsewhere in the U.S. and the world do not have the same connection to Upstate as those who grew up in New York, many of whom attended colleges and universities Upstate. A rapid shift to internet education could have the same impact on Upstate as the shift to digital photography, the development of modern steel “mini-mills,” and the opening of the Saint Lawrence Seaway. It would be nice if some people were thinking about this, and a solution other than trying to stop the future or having tax dollars subsidize the past. So what do public higher education employees get paid? Repeating a paragraph from the prior post on elementary and secondary school employment and payroll (for those who did not read it) when one thinks about what state and local government workers are paid, on average, one needs to think relative. One relevant comparison is what the local government workers in one place earn relative to the U.S. average for local government workers in the same functional category. A second is what local government workers earn relative to the private sector workers who pay taxes to support them. As it happens, Downstate New York, New Jersey, and Fairfield County, Connecticut all have a relatively high private sector payroll per worker, compared with the U.S average. A relatively high cost of living goes along with that, and average public sector pay has to be higher as well to attract employees of equal ability and motivation. However, in a (very) few parts of the U.S. the pay level of the highest paid sector is so high as to significantly skew total private sector payroll per employee, enough to make the total an irrelevant comparison with most workers. Two of those places are Downstate New York and Fairfield County, Connecticut, with their overpaid financial sectors. The chart above shows the average payroll per full time equivalent employee for local government higher education workers in different places, along with the average payroll per private sector worker (overall and excluding the overpaid sectors). The data shows that according to the BLS if the overpaid Finance and Insurance sector is excluded, the average private sector worker in Downstate New York earned 28.1% more than the average private sector worker in the United States. And according to the Census Bureau the average full time equivalent local government instructional higher education worker earned 22.0% more than the U.S. average in New York City and 22.1% more than average in the Downstate Suburbs. A little low, but roughly proportional. In the Upstate Urban Counties and the Rest of New York State private sector workers earned 12.8% and 10.8% less than the U.S. average, respectively. The average full time equivalent local government instructional higher education worker earned 5.6% more than the U.S. average in the Upstate Urban Counties and 5.6% less than average in the Rest of New York State. A little high, particularly in the Upstate Urban Counties, given what these workers’ private sector neighbors are paid – but not to the same extent as upstate elementary and secondary school teachers. Based on the “double comparison” one might say that community college professors have a relatively good deal in California, and a relatively raw deal in North Carolina, Pennsylvania, and Illinois. And what about state government higher education? It is harder to say for a state such as New York, where the local private sector wage level and cost of living varies so greatly between different parts of the state. The average private sector worker in New York State earned 21.7% more than the average private sector worker in the U.S. in 2012, but that is due to higher wages in Downstate New York in general and Wall Street in particular. Pay per state government full time equivalent employee in New York was 6.0% above the U.S. average for instructional workers, and 3.0% above the U.S. average for non-instructional workers. If pay at SUNY and CUNY is uniform throughout the state, this could be a pretty good deal in Upstate New York and pretty a bad deal in high cost Downstate New York. If New York’s state colleges and universities pay more downstate, then perhaps state government higher education pay is relatively low in each part of the state. Then again, the low pay on average may not be relevant for most professors, because New York is known to pay far less to those who are the highest paid state employees in most state governments. The men’s college basketball and football coaches. And this pulls down the overall average for New York. Most New Yorkers, and most New York public college and university professors, probably do not mind. Nonetheless, New York may have difficulty competing for professors with schools that pay more, such as those in New Jersey, Texas and Pennsylvania, and (for Downstate) places with lower costs of living relative to the level of professor pay, such as North Carolina and Florida. This entry was posted in Uncategorized on April 19, 2014 by larrylittlefield.